Blend the crust ingredients together using a food processor until you get a thick pancake-like batter. Heat a nonstick pan over high heat and drizzle with grapeseed oil. Once the oil begins to sizzle, turn the heat down to medium. 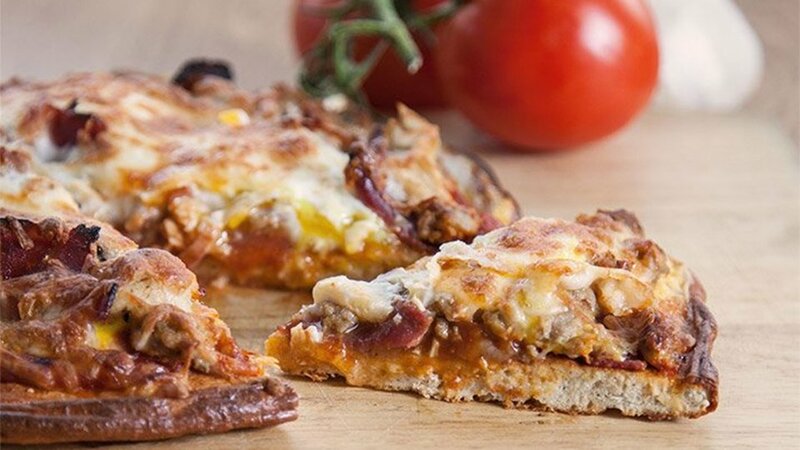 Transfer the crust to a baking sheet, and preheat your oven to 375 degrees F.
Spread tomato paste to within 1/4 inch of the crust's edges, then distribute the chicken and ground turkey (pre-cooked) across the entire pizza. Crack each egg on the pizza, and top with cheese.